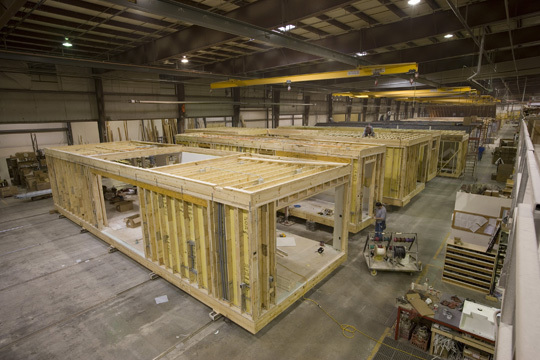 A modular home is constructed from two or more factory-made boxes that are fitted together on site to create a safe, energy-efficient, and cost-effective home. These boxes are called “modules,” hence the name modular home. It is a type of prefabricated housing that has become increasingly popular in recent years since new technologies have allowed for this previously restrictive way of building to become 100% completely customizable. The modular housing industry is currently growing faster than any other type of new-home construction. This is because in general modular homes cost less, can be built faster, are more solid, and are even more environmentally friendly than standard site-built homes. Modular homes are not the same as Manufactured or trailer homes. They are built to exceed the same building codes as traditional site-built homes and are subject to many more stages of inspection along the way to ensure the highest possible construction quality. Once a house is built, there’s virtually no visible difference between a modular home and a site-built home. Learn more about what makes modular homes safer, more affordable, and faster to construct or search our database of hundreds of standard modular home plans.